During our Tour to Las Vegas Nevada, Team Wash Guys displayed the Corporate Command Center in front of the Race Rock Cafe. On display were actual NASCAR Race Car Winners, sponsored trucks, memorabilia and great food. It was a great event. The place is jam packed with race car sports enthusiasts. Many people were extremely gracious and helpful while we were there. We would like to take a bit of time to acknowledge the contributions of everyone who helped make this such a great and productive trip. The Las Vegas Police Department for holding up traffic when maneuvering into position. The locals and tourists for their gracious reception. The Tour bus who allowed all the Japanese passengers to exit the bus for pictures. The Cafe for allowing us to depart early for the ICA-International Car Wash Association's first annual World Care Car Expo being held at the Las Vegas Convention Center. The Convention Center for allowing us space to park our 70 Foot Rig in their Lot during the show. The Designers and architects who asked and listened to our advice on ways to better design parking structures and robotic parking structures to allow for the increasing demand for onsite car washes. 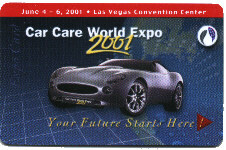 Also scheduled during this time was the International Parking Institute Magazines Annual Convention. If you will note we were featured in their magazine in November of last year. We enjoyed meeting with members of the parking industry as we help them to provide their customers with added value and let us help them achieve greater per stall average profits. 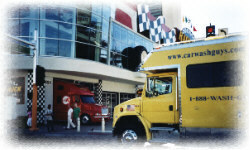 The RIO Hotel and Casino for allowing us to display our unit for two days. The Las Vegas Automall for the use of the parking area to display Team Wash Guys. We were happy to learn that many of our current customers in Reno NV also have dealerships in the Las Vegas Automall one the World's Largest Automalls. Our competitors for staying open late to wash the rig at midnight and allowing us to hire their key labor since they are selling properties allowing us to come into town and enter that market with little organized competition. It was a great visit to Las Vegas, Nevada. It is a great market we are entering and even though the ICA Show was not well attended by participants or independent carwash owners, it was extremely well attended by the Industry vendors. We made some great contacts and had fun harassing the less fortunate carwash owners who must compete with us in their individual markets.